Maybe it's somehow fitting that this will be the last ever blogpost on this blog. It marks the end of two eras - the end of this blog, as in a few days time my new site, Dale & Co launches, and also the end of a life. Five hours ago my beloved little Jack Russell, Gio, died. Those of you who have ever had the privilege of owning a dog will know what a devastating time this is for me and my family, who loved him with all our hearts. It is scant consolation to know that we gave him the best life a dog could possibly have, as a gaping hole has opened up in our lives, which can never, ever be filled. 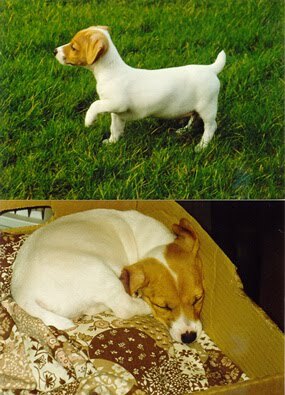 Most Jack Russells are characters, and Gio was no exception. 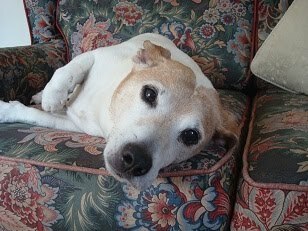 He was a cheeky little blighter and had us all wrapped around his little paws. 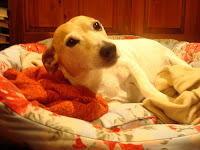 When I grew up we had always had Jack Russells so I knew what wonderful dogs they could be, but I had no idea this little mite would give us so much pleasure and become such an integral part of our lives. He was a dog that everyone loved. And Gio loved them back. Well, almost everyone. 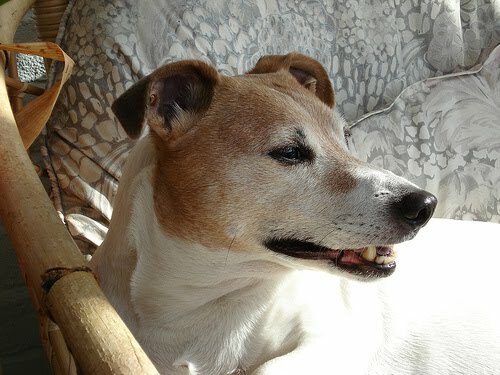 He didn’t care much for children, and let them know it in a typical Jack Russell kind of way - he would give them a nip. For some unfathomable reason he also didn’t like people on bicycles. If he saw someone riding a bike he would literally go mental. During the first few years of Gio’s life, he would come to work with John and me at our Westminster bookshop, Politico’s. We barred him in behind the counter, but on several occasions he escaped and delighted running round the shop at full pelt, causing total havoc. The customers thought it was an absolute hoot. In his early years Gio was a very fit and active dog. He loved going to the park and haring after a tennis ball I would throw. He never tired of it and would happily carry on for half an hour given half a chance. Sadly, this activity came to an end when one day he jumped off a sofa and damaged a knee ligament. Although we were still able to take him for walks, he wasn’t allowed to run at all, which meant that over time he became a bit of a porker. This proved to be a real problem as Gio was a terrible food thief. You’d give him his meal and ten minutes later he’d give you a look which said “Daddy, why are you starving me, give me some of your doughnut”. And believe me, he had this look which made you want to give in to his every demand. We didn’t, but felt very guilty for refusing him anything. My worst memory of Gio's life was when he was run over. And it was my fault. He was on an extendable lead and I was walking ahead of him when I suddenly became aware of an approaching car. It happened in slo-motion. I heard a thud, and then Gio emerged from the side of the car and sat down on the pavement holding his paw up. I gathered him up, ran home bawling my eyes out, thinking he would die. We put him in blankets and rushed to the vet who diagnosed a sprained leg. It could have been so much worse. 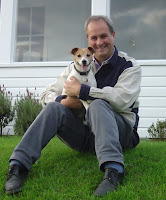 Back in 2005 Gio spent a morning with me on the general election campaign trail in Cromer. We bought him a union jack coat. But sadly even Gio’s charms couldn’t rescue me from an inglorious defeat at the hands of Norman Lamb. Gio was a dog that liked his routine. At 2pm precisely he would sit by the dog chew draw. At 10pm he would demand his nightly rich tea biscuit and slurp of cranberry juice. On his nightly walk he would go so far and no further. And like all Jack Russells, a walk in his view was less about exercise and more about having a good old sniff. But over the last year there had been a clear decline in the little scamp’s health. He developed a slight heart problem and seemed to pant too much. We were warned by the vet that he might not be long for this world. But he was a doughty fighter and bounced back again. But just before I went to Australia it became clear that he was struggling. I dreaded going away for three weeks with the thought in the back of my mind that I might not see him again. My partner John and I chatted on Skype video twice a day and I made him show me Gio each time, just so that I could be reassured he was still alive. I know John dreaded having to tell me he had died while I was away. Whenever I go away the one thing that keeps me going is the thought of the welcome Gio will give me when I get home. And that was my abiding thought as I flew back from Australia the Sunday before last. But instead of being delighted to see me when I walked though the door, and instead of giving my face a good licking, he just looked at me to say “Oh, you're back then.” And then he wandered into the kitchen. I was gutted. And I knew then that something was seriously wrong. He had also clearly lost a lot of weight. He’d come to my sofa for “a love” – and just stare u at me into my eyes, as if to say “Daddy, what’s wrong with me, please put it right”. That look never failed to bring a tear to my eye. Anyway, the vet then diagnosed diabetes. We were told he’d need an insulin injection every day. But then a minor miracle happened. An hour after the first injection he was back to his old self. He was eating properly, full of life, tail erect, being cheeky, keen to go on his walk, and everything seemed right with the world. But it wasn’t to last. 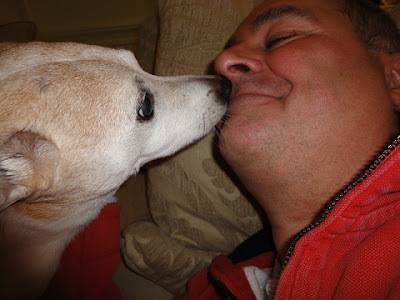 I got home from my radio show on Friday night to find that a few minutes before I got there he had had what we thought was a hypoglycaemic attack. He had fitted. We got the vet out to see him, hoping beyond hope that he would be able to fix him. Instead he delivered the devastating news that Gio was unlikely to make it through the night. It appeared he had had a stroke. He wasn’t in pain, but the sadness in his eyes told its own story. As the hours wore on, his breathing got gradually weaker, and at 5.30am he passed away. Our lives will never be the same. He meant everything to John and me. He and John were devoted to each other. Gio knew that if he felt ill, it would be John that would make him better. He was the constant in Gio's life. John and I are very different. John is stoic and knows what to do if Gio is in pain. I collapse into an emotional jelly. And so it was last night. Gio spent most of his ast few hours staring up at John and I. If he could have spoken, he would have said to John: "Thank you, Daddy, thanks for being there for me. Thanks for giving me a wonderful life". If you haven’t had a dog in your life you cannot comprehend the gaping void that can never, ever be filled. Someone said the best thing to do it get another dog immediately. I just couldn’t. It would feel like betraying his memory. As I complete this tribute to the best friend I am ever going to have, it provides little solace to know in my heart that we gave Gio the best life a dog could ever have. Maybe one day we’ll feel ready to try to do the same for another rescue dog. But there will never be another Gio. I last came to Australia twenty years ago, in September 1991. Last time Australia was in recession was in 1991. The week I arrive here the country goes into negative growth for the first time since 1991. Sorry, Australia, I seem to bring recessions with me. I didn't mean it. Honest. There are very few countries in the world I could live in. Australia is one of them. 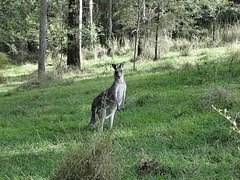 When I came here twenty years ago, I had expected not to like Australia. I have no idea why I thought that, because I fell in love with the country. Unfortunately, on that trip I only had about 2 days free time so had little opportunity to have a proper look round. We went to Sydney, Melbourne and Canberra, but spent all our time working. We were advising the Australian Liberal Party on reforming laws governing the employment of dock workers. On our first day in the country we were warned that if the dockers' unions found out we were here, our lives would be in danger. Nice. There was no such warning this time! I never intended to wait twenty years to return, but time somehow just slipped by. So, why am I here? Well, those nice people at Microsoft invited me to do a week long speaking tour, and frankly, who was I to refuse? I then thought that it was rather idiotic just to spend one week here, so tagged on another week, and then had the bright idea of broadcasting my LBC show for a week from Sydney, and I will be doing that from 13-18 June. Unfortunately I miscalculated the time difference and I will actually be broadcasting my normal evening show from 4am to 7am in the morning. 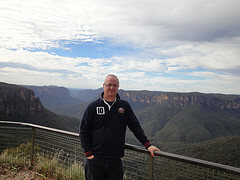 I arrived in the country on Sunday morning and had a day and a half before my first speaking engagement. On Monday morning I recorded a 30 minute podcast interview with one of Australia's leading bloggers, Stilgherrian, which you can find HERE. "Loving the hairstyle of the Deputy Leader of the Opposition in Australia. I hear she was Krystal Carrington's stunt double in Dynasty"
My first speaking commitment was at the Sydney Institute on Monday evening, where I gave a talk on the world of political blogging and new media. It was a very engaged audience, who seemed well versed in British politics. Sajid Javid MP had been there the week before. Later that evening AMP hosted a dinner for me at the top of their harbourside office block. The night views over the Opera House and Harbour Bridge were stupendous. But it really was singing for my supper. There were about 20 guests and they grilled me between courses for a good couple of hours. Still, liking the sound of my own voice has never been a problem for me! "The UK House of Commons is often accused of behaving like a playground. 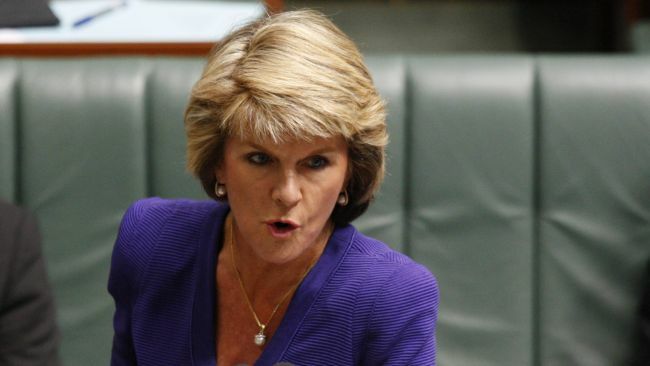 It has nothing on the Aussie House of Reps. Unbelievable behaviour." This led to quite a strong reaction on Twitter and gained me about 200 extra followers. Remarkably virtually everyone agreed. In retrospect I suppose I might have got a lot of tweets accusing me of being a whinging Pom, but there was only one blogger who really took issue with me and that was because of a bit of a misunderstanding. As a result of the tweet the BBC World Service rang and asked if I would expand on my view on their World Update programme with Dan Damon, which I duly did. Unfortunately they then posted a heavily edited transcript of my remarks, which they made out was an article by me. It wasn't. And so it started. Radio interview after radio interview about what I had said. This afternoon I did a half hour phone in on Sydney's ABC 702AM station, which is their equivalent of ABC. Remarkably every caller agreed with me. 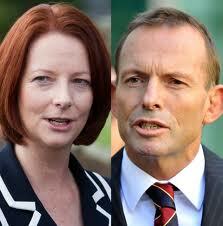 Tomorrow I am on with Andrew Bolt on the Melbourne Breakfast show and then a station in Perth. It's remarkable what one tweet can launch! If you think I am exaggerating about the Australian Parliament read THIS superb article by the FT's Matthew Engel. That evening I met a dozen Aussie bloggers for dinner, along with several people from Microsoft. Next morning, it was showtime! 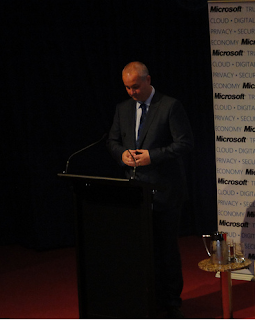 I delivered the keynote speech at the Microsoft/Open Forum Politics & Technology Forum at Parliament House. My speech was to be on Openness & Transparency and was scheduled to last 40 minutes. I have to say I don't think I have ever given a 40 minute speech before. I reckon that unless you're Martin Luther King or Barack Obama, people tend to switch off after 20 minutes no matter how good you are. So I deliberately timed a vicious attack on Julian Assange for the 25 minute mark. It worked. I think. I then took part in a 90 minute long panel with top Aussie blogger Stilgherrian (that's his real name. He doesn't have a second one), Gianpaolo Carrera from Microsoft, Professor Eric Clements from the US, Shadow Chancellor (or Treasurer as they say here) Joe Hockey and Sentator Kate Lundy, PPS to the Prime Minister and Sarah Palin look-a-like (and I mean that in an admiring way, Kate!) and an expert in social media. It all seemed to go off well. I wasn't sure if my speech had worked, but all the twitter reaction seemed positive. Later on, over lunch, I delivered a second speech to the All Party UK/Australia Friendship group of Senators and MPs. It was good to meet so many of them, especially the redoubtable Bronwyn Bishop, who I hit it off with - she's Australia's answer to Ann Widdecombe! I talked about the role of technology in the 2010 election. Later in the afternoon we flew back to Sydney. I was due to have dinner with my old colleague from 18 Doughty Street days, Alice Wright, but I was so tired I put her off until Monday. Today I had breakfast and lunch with Shane Stone. Shane is on the board of the holding company which owns Biteback, and he is the former Chief Minister of the Northern Territories and also a former Liberal Party President. Next week I am going to Darwin to stay with him. We're apparently going fishing in crocodile country, 300km west of Darwin. Apparently the boats have to have reinforced floors to stop the crocs biting through. I shall try not be a wuss. I also went to the Microsoft offices to talk to 30 or 40 of their staff. I did it all off the cuff today, which is my favoured method of speaking and we had a really good Q & A. And that was the final part of the working bit of my trip. I now have 6 days in Sydney to do as I please. I reckon I shall take a few day trips out of the city, maybe to the Blue Mountains one day and the Hunter Valley another. I also want to do a Sydney Harbour boat trip. And I also need to start thinking about inviting guests to appear on my LBC show. The question is: will I be able to persuade people to come to the studios for 6am! Just a final word about my first impressions of Australia on this visit. The one thing that has struck me so far is that it is an incredible optimistic, cheerful nation. People actually smile at you. You don't get many smiles to the dozen in London, but here, it's as if people are enjoying life and are not letting problems get them down. Sydney is a very cosmopolitan city and on the outside at least has coped very well with integrating a huge number of migrants from fellow Asian countries. But the prices! My God, this is the most expensive place I have ever been in my life. It's far more expensive than Scandinavia and Switzerland. A Mars Bar costs £2! A can of coke in the hotel is £5. I ordered a club sandwich, a cranberry juice and a cherry strudel desert. The bill came to more than £55. Breakfast is £30. Madness. Luckily, it;s those nice people at Microsoft who are paying, but after Saturday I am on my own! In the next few weeks I will be launching a new website. In effect it is a site which will contain daily articles from me, but also 7 or 8 other articles each day from a range of other contributors. It will be like a blog, in that people can comment on every article (after registering) but it will look more like a magazine or newspaper site. It will cover politics, media, the arts, books, films and sport, but with an emphasis on politics and current affairs. Contributors include more than fifty politicians, journalists, commentators, public affairs professionals, academics, pollsters, elections experts, business people and radio presenters. The site will have no editorial line. It is not a right wing site, as will be evidenced from the range of contributors. But I have a problem. I still can't decide what to call the site. I have canvassed suggestions, but none has really stood out as obvious. I want the site to be clearly associated with me, yet the site name, or subtitle, needs to clearly demonstrate that it is not just me and that many others are involved too. So I want you to vote and we'll see if you all come up with a overwhelming favourite. 7.30-10PM Well, what a day it’s been. Even I, as an ardent royalist, hadn’t expected it to be quite so inspiring, exhilarating and enjoyable. It was a day when the whole country came together to wish a very special couple all the happiness in the world. It was a day of pageantry and pomp, and don’t we in Britain do it well? Celebrations are still taking place all over London as street parties continue right through the evening. What are we going to do over the next three hours? We’re going to ask you about your memories of the day. How was the Royal Wedding for you? I want to know how your street party went, what did you think of the ceremony, of the dress, of, ahem, Princess Eugenie’s antlers? And if you have republican sympathies, was there a part of you that enjoyed the wedding just a little bit more than you thought you would? Phone me on 0845 60 60 973. 1. Ben Brogan wants to see Cameron's inner Tory. 2. Michael Crick thinks Lansley may swap with Hammond. 3. Quentin Letts gives his thoughts on the sexism scandal. 4. Political Scrapbook reveals Chris Grayling faces sleaze probe. 5. Caroline Crampton wonders if Norman Lamb has got his facts right. 6. Gay Collins looks at how to achieve equality in the boardroom. 7. Daniel Knowles makes Ed Balls aware of the facts. 8. Richard English stands up for Britain. 9. Walaa Idris addresses the issue of Barack Obama's birth. 10. David Gibson hopes this wedding questions future Royal Invitations. 11. Byrne Tofferings supports the EU, go and tell him what you think. As I wrote HERE, in a few weeks time, I will be launching a new website. But I have a problem. I still can't decide what to call it. It's a kind of blogazine - I will write every day on the site, but there will be 30 or 40 other contributors from politics and the media. Some you will have heard of - others you won't know. The site won't have any political line, and we'll have film and book reviews too. Iain Dale & Co, Iain Dale & Friends, The Iain Dale Collective, The Iain Dale Collection are all suggestions that have been made, but I wonder if it would be better to have a name which didn't include mine. Someone suggested Agora. I rather like that, but maybe it's too offbeam, and not enough people know what it means. One thing I do know is that I don't want to use a derivative of my surname. And to encourage you, I will offer £100 worth of books to anyone who comes up with the name I eventually go with! 1. Norman Tebbit gets tough on Tim Farron and the Lib Dems. 2. Caroline Crampton speaks to Andrew Lansley on NHS reform. 3. Guido Fawkes argues against injunctions. 4. Charlie Beckett thinks Marr should quit interviewing politicians. 5. David Singleton looks at how David Cameron has ended spin. 6. James Forsyth reckons the PM needs to control his temper. 7. Andrew Neil rejoices as Britain avoids a double dip. 8. Nicholas Watt examines the future Lib Dem leader. 9. Conor Pope shows the danger of Parliamentary emails. 10. Natalie Gonnella looks at what US conservatives think of Trump. 11. Alastair Campbell can't call the French election. 12. Sam Bowman wants to make libertarianism more relevant. 7PM Syria: What should we do about Syria? Is diplomatic protest enough? Should the coalition widen its remit to take action against Syria if the killings continue? Guests: Sir Andrew Green (former Ambassador to Syria) and Roger Godsiff MP (Lab, Chairman of the All Party Group on Syria). 8PM Royal Wedding: William and Kate haven’t issued a wedding list, but most couples still do. Are they outdated? Do they irritate you as much as they irritate me? If you were buying a present for William & Kate, what would it be? What’s the worst wedding present you got, and would it have been avoided if you had had a wedding list? 1. Amber Elliot gives her take on the AV referendum. 2. Ed Staite reckons Chris Huhna has damaged politics forever. 3. Thomas Sowell warns against the Republicans choosing Donald Trump. 4. Guido thinks using Mandy is a sign of desperation. 5. Alex Deane highlights Andrew Marr's hypocrisy. 6. Nick Silver explores the true scale of our national debt. 8. Mark Ferguson shows why Labour aren't ready for an election. 9. Daniel Korski wonders if we will see a Deputy Prime Minister's Office. 10. David Hencke supports progressive electoral reform, but is voting no to AV. 11. Katharine Birbalsingh wants results before we give teachers a fortune. 12. David Howden examines Mervyn King's "Operation Bernhard". 1. The ASI encourages the government to allow free schools to make a profit. 2. Graeme Archer tackles the myths of Yes to AV. 3. Archbishop Cranmer flaunts the idea of Arnie, President of Europe. 4. Walaa Idris wonders if it is time to say goodbye to the EU. 5. Christine Odone shows why Kate Middleton will be better than Diana. 6. Alistair Thompson thinks Miliband needs to worry about AV splits. 7. Nick Pickles reminds the Daily Mail of their paparazzi pledge. 8. Julian Huppert attacks the government's digital policy. 9. Aarron Ellis doesn't think we should be in Afghanistan. 10. Mark Ferguson reckons Nick Clegg is a massive liability. 11. Douglas Carswell has discovered the eurosceptics secret weapon. 12. Tim Worstall shows us how to make money out of the new Cuba. 7PM NHS Cuts: Are NHS cuts a complete myth? That’s the conclusion the Daily Mail’s James Slack has come to. More money than ever is going into the NHS. Is it about time we faced up to the truth that it is trade unions and vested interests who are misleading the British public and that the supposed cuts just aren’t happening? 8PM Cigarette Bins: Westminster City Council today won their court case against Addison Lee, the cab company, who were being challenged over their sponsorship of cigarette bins outside pubs and restaurants. The council spent £100,000 on the case. Do you, like me, think this is a scandalous waste of public money? 1. Brendan O'Neill defends the working class. 2. City Unslicker wants peopel to stop using children as shields. 3. Daniel Hannan shows that an EU budget hike will wipe out spending cuts. 4. Matthew Hancock thinks Labour are taking lessons from the US. 5. John Redwood calls for a freeze in the aid budget. 6. Political Scrapbook looks at the loser Lib Dem Lords. 7. Mark Pack can even learn a thing or two from Lord Ashcroft. 8. Anthony Painter analyses the conservatism of the Left. 9. Madsen Pirie offers an alternative to bailouts. 10. Labour Uncut are shocked by Tom Watson's apology. 11. Direct Democracy aren't pleased with the EU budget rise. 12. Charlotte Henry tweaks the Cabinet. 7PM EU Budget: Incredibly the EU thinks Britain should pay another £680 million into its coffers. It wants to increase its budget by 4.9% next year – that on top of the 6% increase it demanded this year. Why should British taxpayers pay a single penny more into the EU budget when we’re having to make budget cuts at home? Guests: Nigel Farage and Patrizio Fiorilli, a spokeman for the European Commission. 8PM The Living Wage: The cosmetics chain Lush has become the first private sector company to guarantee its staff a living wage of £7.85 an hour. No Oxford Street retailer will commit to the scheme. Should London employers follow the 140 City organisations and the public sector and adopt the Living Wage? Or do you think that employers have far too many burdens and red tape to deal with that they just can’t cope with any more extra costs? 1. Mats Persson analyses the price of the Euro in Finland. 2. Colin Bullen looks at the betrayal of our fishermen. 3. Guido has 170 billion reasons why Brown shouldn't be IMF Chief. 4. James Green reports that the Daily Mail is going to takeover the world. 5. Witterings from Witney shows why MPs work for party, not constituents. 6. Mark Ferguson takes a look at the "Purple Bookers". 7. Roger Helmer asks where are the cuts? 8. Conservative Home unveil Boris' new team. 9. Dizzy thinks Libya is good, especially if it is for oil. 10. David Gibson reckons the USA should forget Cold War feuds. 11. Biteback are pleased with the Twitter furore they have caused. 12. Political Scrapbook reveal more than 50 Lib Dem councillors have defected. 8PM IMF: David Cameron is said to be ready to veto Gordon Brown as head of the IMF? Is he right to do so, or is it a sign of political vindictiveness? Guests: Derek Scott and Jacqui Smith. 9PM LBC Medical Hour with Dr Peter Ilves. 1. The Evening Standard calls on Londoners to vote NO to AV. 2. Ben Brogan proves why George Osborne is right. 3. The ASI reckons the True Finns are a sign of things to come in the EU. 4. Jim Pickard shows Widdy would have won Strictly under FPTP. 5. Jeremy Browne highlights the achievements of the Lib Dems. 6. Nick Robinson is wondering where Nick Clegg has gone. 7. Dan Hannan explains why Britain shouldn't join the Portugese bailout. 8. Political Scrapbook report that Liverpool Lib Dem Leader quits. 9. The Mole has two good reason why Vince Cable shouldn't get the sack. 10. Mark Wallace reveals the mess behind the scenes at Census 2011. 11. Rory Meakin wants to go without publically funded dance. 12. Will Heaven thinks two young historians maybe the future of the Conservatives. Several people have asked me to post the interview I did on Thursday on my LBC programme with "Family commentator" Lynette Burrows. It lasts ten minutes and I can assure you is well worth listening to the end. I was speaking to her about whether kissing in public is ever acceptable, in the light of the two gay men who were thrown out of the John Snow pub in Soho for kissing.